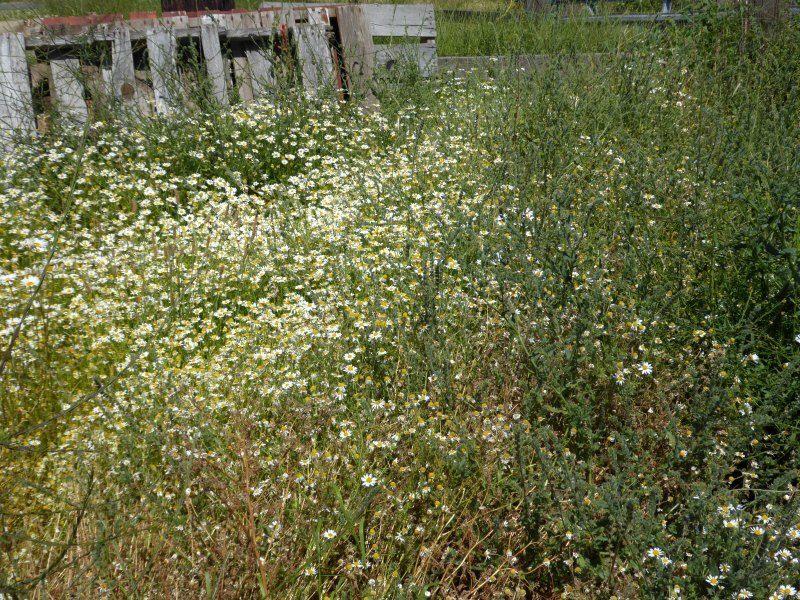 In a seldom-used side yard, we have a tangle of weeds. A couple weeks ago I happened to notice a clutch of eggs among the vegetation -- the latest "hot spot" for hens to lay. I gathered up the eggs and tested them for freshness, and thereafter kept an eye on the weed patch in case more eggs appeared. A few days ago I happened to hear a characteristic noise as I was near the weed patch -- the "braaaaack" of a hen who is setting on eggs. 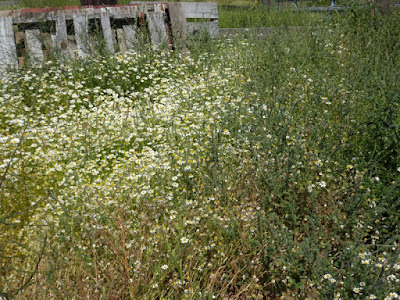 I parted the vegetation and spotted a hen so thoroughly bedded down amidst the weeds as to be totally invisible. I went into the house and told Don, "I think we have a hen setting in the weed patch." Beyond that, we didn't give it much thought. 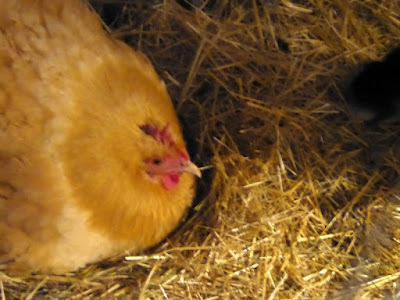 Yesterday I took it into my head to lift the hen off her nest and count how many eggs she was setting on. I waded to where she had her nest, but the spot was deserted. Instead the hen was a couple feet away, invisible in the weeds, clucking and making a fuss. Three eggs were visible in the old nest amidst a mess of smashed eggshells. "Oh well, something ate the eggs," I concluded, and turned to leave. But the hen's agitated clucks were interspersed with -- peeps. Lots of peeps. I chuckled and went to get Don. "The little thief stole a nest," I told him. "Can you help me gather up the chicks?" We found an empty bucket and carefully -- lest we step on any stray babies -- waded into the weed patch. Don put on gloves and pulled out some of the more obstructive plants while I picked up the squawking and protesting hen and put her in the coop. 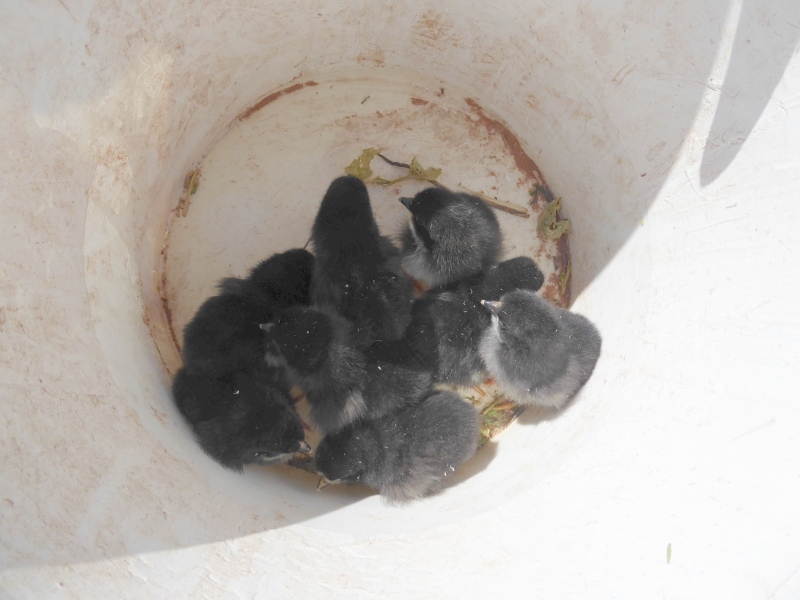 By the time I returned, Don had seven chicks in the bucket, and I found one more. It's kind of dark in the coop so these photos didn't turn out terribly well, even with a flash. 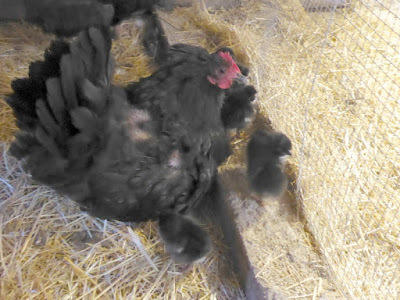 Here the mother hen is settling into a corner and gathering her chicks under her feathers. Here the mother hen and her chicks are right by the edge of the cage, while two other hens stare through the mesh at the chicks. "Hey, I want some of those too!" 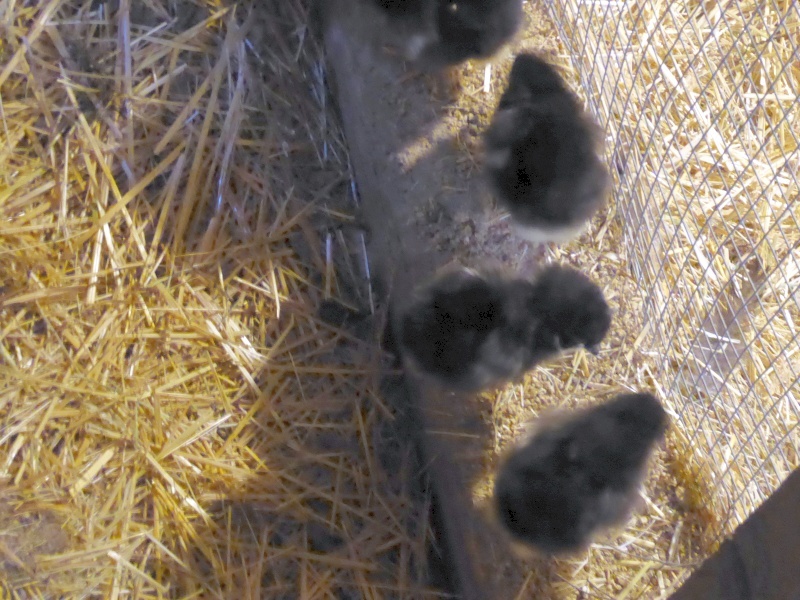 Aww, there aren't many things cuter than baby chicks. A funny little incident: one of the newborn chick wandered too close to the Buff hen, who promptly started pecking the chick. 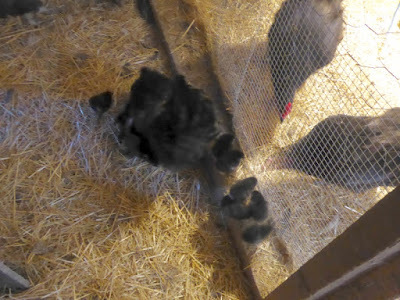 I opened the cage door, ready to rescue the chick, but by the time I got inside it had -- disappeared. I lifted the squawking Buff off her eggs and, sure enough, found the chick under her feathers. They may protest, but setting hens adopt strange chicks at the drop of a hat -- in this case, in about five seconds. 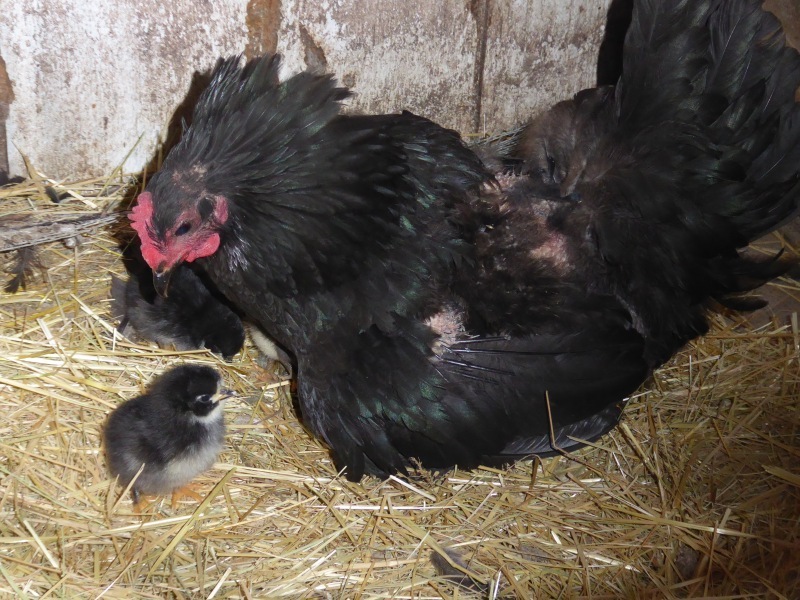 Still, I put the chick back with its mother. Eight chicks. And another setting hen as well. Gonna be a crowded coop this winter. Better watch out for bullies in a crowded coop, but I'm sure you know that. Awwww!!!!! It's been awhile since we had broody hens and baby chicks! I miss it! I cannot have a rooster! Otherwise, I would be in baby chick business. How sweet. Goodness, we have 13 chicks currently running about, have given away 13 more, and 20 Muscovy ducklings are out and about. Those ducklings are invaluable for cleaning all the standing water of mosquito larvae (we have fewer mosquitoes out here in the swamp than former daughter in law whose house is on a sandy area at the beach). We've been trying to find and eliminate nests but the chickens (and ducks) are craftier than we are. Faster, too!